Tending bar at a party or playing mixologist at your own private soirée need not be as difficult as it may seem. The only difference between the experienced and amateur bartender is practice. While you may not be ready to flip bottles or create flaming drinks yet, you can easily pull off a one-night bartending gig. No bar on earth has the ability to serve every drink people request. If you want to add to the staples above, keep your bar menu to the same theme as your party. Add beer for a casual get-together or gin and vermouth for a more upscale event. Another option is including a white wine and a red wine. These need not be very expensive if they are simply another drink option among many. If you'd like an even smaller menu, offer only a signature cocktail and drinks that can be made using the same ingredients. 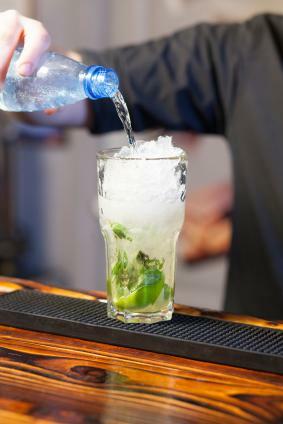 For example, if you're having a Kentucky Derby party, limit the bar menu to mint juleps and similar ingredient drinks. You can also create your own signature drink made specifically for your event, such as an alcoholic lemonade or a fruit-flavored martini. Oftentimes, hosts will ask guests to bring their own ingredients if they would like to drink something specific or if they have allergy concerns. Remembering drink recipes can be difficult for a party host or new bartender. Follow these quick tips for remembering how to mix them. Use acronyms/flash cards to help you memorize the recipes before the party. For example, a Mai Tai is 2 Rat Pog: two rums, almond, triple sec, pineapple, orange and grenadine. Tell the "patron" you know several recipes and ask which one they prefer or create a menu board with a list of the drinks you know how to make. Many bartenders have a backup cheat sheet just in case, so don't worry if you can't remember the cocktail recipes you plant to serve. Just arm yourself with a sheet behind the bar and you're set. Bartenders come up with new drinks the same way chefs come up with new foods; they try different things and figure out what works. Every expert mixologist has come up with a few duds, so do not worry about failing. Try a new flavor of vodka with your favorite type of juice, or substitute rum for tequila in a cocktail recipe. Try new garnishes, like different fruits, graham crackers, or even crumbs from your signature dessert. Use your imagination and you'll be a drink-mixing god in no time. The biggest mistake amateur bartenders make is adding too much or too little alcohol to their drinks. While experienced bartenders can time their pours to get it right, when you're first starting out, use a jigger. The smaller side is one ounce and the larger side is an ounce and a half. Another reason for poor-tasting drinks is simply that they weren't mixed for long enough. Always shake for 15 seconds or more. That's about the time it takes to sing the song "Happy Birthday" twice. Shake with the lid facing the wall, not your guests. That way you don't risk them getting splashed. If you don't have a bar fridge, keep your mixers in a tub of ice. If you use warm or room temperature sodas or juices, it can severely impact the flavor of your drinks. Beer and white wine should also be served chilled. Unless you're being paid to do so, there's no reason why you have to spend the entire night behind the bar. Instead, let trustworthy friends step in so that you can enjoy your own event. They may even be able to share some tips of their own with you if given the chance to guest bartend. Following these expert tips for making your own party drinks will ensure you have the supplies, tools, and knowledge necessary to make mixing drinks an easy task. These tips can give you the confidence you need to make the bar a hit at any party.